the group can cancel 7 days before the arrival. we offer quiet rooms for good sleeping. The ideal place to spend a pleasant and quiet holiday. 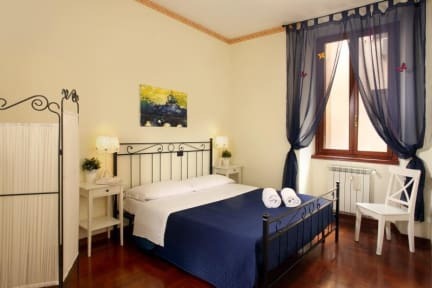 Maison de Julie is set in one of the most quiet streets in the historical centre of Rome. This is the right place to start your sightseeing tour of Rome. Just around the corner from the B&B is the famous Opera House, the National art gallery and endless beauties of the Eternal city such as the Roman Forum (15min), the Colosseum (20min), the Trevi fountain(10min), the Spanish Steps (25min), Piazza Barberini (10min), Pantheon (20min) and Piazza Venezia (10/15min). B&B is equipped with all amenities that you need. We offer quiet and silent rooms. Included in the price per room we also have breakfast, wi-fi, tourist information of all kinds. They were very acomadating friendly and really good hosts we were very satisfied staying there great experience thank you! Mrs. Julie's B&B was great! It was a nice sized, clean room in a great location. The staff were friendly and helpful with our needs and even booked a taxi to the airport for us! Nice bed but the breakfast was less than exciting. 1. It did not come at 8 am as I was told so I had to go on with my day without eating. 2. It was just packaged desserts. The room itself was wonderful, big bed, nice bathroom. The AC didn't really work but there was a fan so it was okay. The complementary water was a very nice touch. Nice place to stay if you're not alone. Also you don't need to go to the separate building to check in, they haven't updated their info. Great location, clean and spacious room. Friendly and helpful staff. The score could have been higher were it not for the very old dodgy hot water kettle in the room which gave off bits of white floaty things in the water! Please buy a new kettle for the room! Good location, nice building. Very poor or non existing WiFi connection in the room, the AC was not working and the shower had "warm" drops of water. Bed was uncomfortable and shower wasn’t very good. Good location though. Good if you want a cheap, private place to stay for the night. Arrived early, and nobody was there to help me for hours. They stated they would be there at 5, and then were late again and the staff working lied and said they had been there the whole time. After everything was handled I went downstairs to check the Key i was given before i go for my walk and it doesn’t even work.... had i gone and not checked i would’ve been locked out. As the staff is helping me replace the key, he answers his phone and sits there talking for 5 min while i’m waiting to go.. When we arrived, we rang the doorbell and nobody answered. 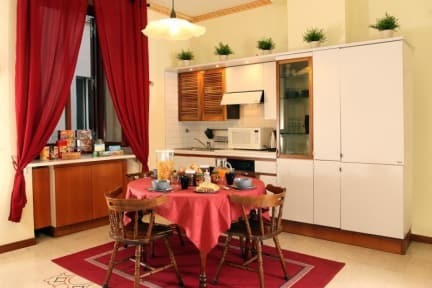 (It is an apartment in an apartment building which has been divided into rooms). I called the number for the owner, who answered and said that we were 'late', even though it was 5pm and we hadn't stated any specific arrival time. He said there was a problem and he would not honor our reservation because he was not in the area. We reminded them that we had paid for a reservation, and he finally let us in. The mattress was awful.